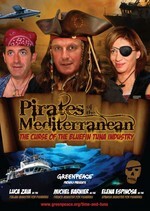 Greenpeace Spoofs Pirates of the Caribbean. The Curse of the Bluefin Tuna Industry. Cringe. See variants in The Economist (really?) and last week's European Voice. 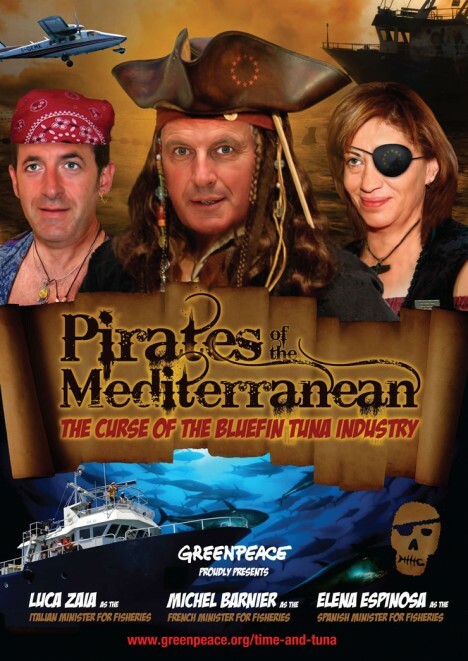 The people named on each poster are villainous Fisheries Ministers that failed to better regulate Mediterranean bluefin tuna. God help us. Moved by a conviction stronger than yourself? Send angsty pro-tuna letters to Fisheries Ministers for Italy, France and Spain. Great Apes No Longer to be Used in Commercials. 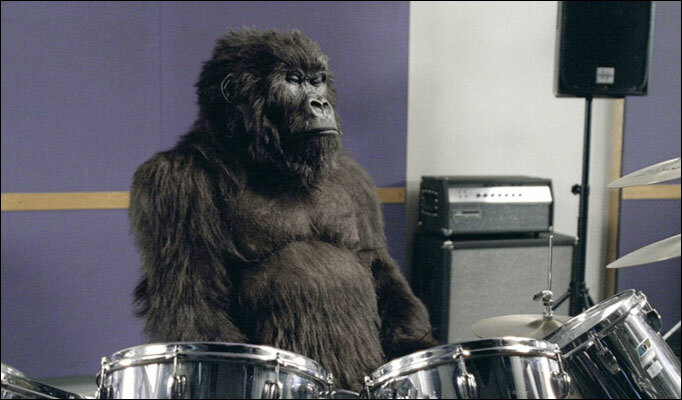 Cadbury Drummer Said Despondent. PETA announced that the Ad Council will pledge to no longer use great apes in future commercials because of the way in which the animals are raised and trained. I'm just bummed because I won't be able to see the little hairy critters use laser pointers anymore. Hilarity ensues no more! If I'm Cadbury? I'm setting up a microsite to accept donations to help find work for their soon to be out of work drummer. His future once promising, him and his band will now be forced to work small clubs just to get by. Sad. Like a sledgehammer, this Duval Guillaume-created ad for Belgium's Organ Donor Foundation bluntly deflates mens' egos and, like a reality slap upside the head, manipulates them into realizing the rigid organ they have in hand isn't the one which will do this woman the most good. As Adland writes, "thanks for that lesson in truth in advertising Duval Guillaume." And as we'd say, Cruel, cruel and more cruel!" But we'd also say," Simply brilliant." Maybe because using plastic bottles to promote tap water ain't workin' all that great, Tappening decided to accomplish what many have before it: self-promotion by way of Obama. 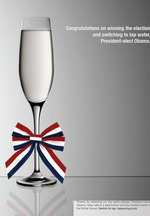 Check out the triage of ads it produced to "congratulate" Obama on his "decision" to stop drinking bottled water. 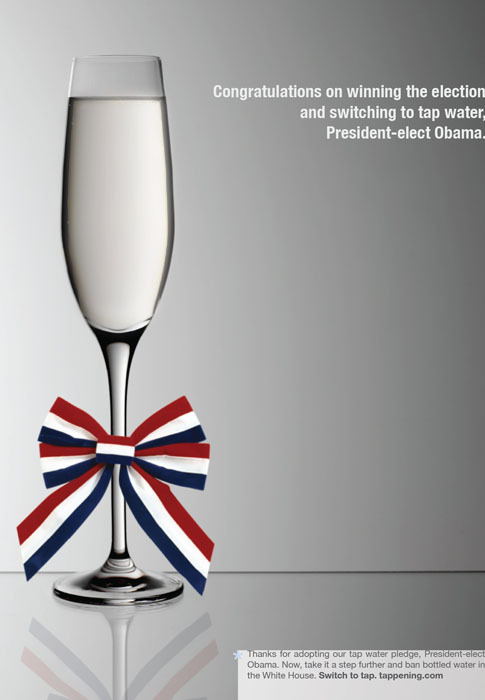 Hoping to seem witty, the Tappening also attributed Obama's success in winning Democrats' favor to his anti-bottled-water stance. 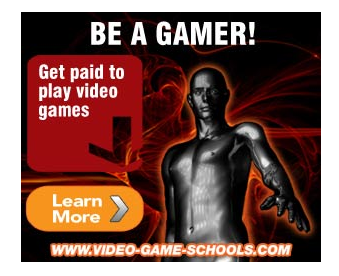 That's the first I've heard of it. If Obama actually did declare war against bottled water, it hasn't stopped him from offering some to his fainting fans (scroll to 1:56). Adrants reader Molly sent us a spot in which JFK is reanimated and his words altered to promote sustainable energy technology. CG technology was used to "remodel JFK's mouth word for word," according to the pressie. Produced by AKQA with help from The Ambassadors/Amsterdam for Greenpeace, it debuted last Monday at a press briefing in Berlin.